At the beginning of October, I had the opportunity to participate in an amazing experience, the 2012 George Hincapie CEO Cycling Challenge in Greenville, SC. From Thursday afternoon until lunch on Sunday, I was at what I can best describe as a cycling fantasy camp. The participants in the weekend were a group of six male executives including me. One was the president of Schlumberger and another, the owner of Blackberry Farm. We ranged in age from thirties to fifties. We rode about 150 miles over three days. The three rides included some mountain climbs and culminated in a timed climb up Paris Mountain. During the weekend, I learned about maximizing training from a pair of coaches from Peak Coaching Group one of whom, Hunter Allen, quite literally wrote the book on training with a power meter. (He gave me an autographed copy.) They supplied power meters which the mechanic installed. (A power meter is a device which measure how much power you are actually applying to the move the bike. It is the most accurate way to measure the effort applied while riding.) Check out the additional data on my climb up Caesars Head. The fourth chart down is the power. You can see I was working really hard on the climb! It was very helpful having Hunter explain how to properly ride out of the saddle on the ascent and the other coach (Tim) help me understand better how to properly descend. George and another rider still sped by me going over 50 mph! The picture above is the group at the top of Caesars Head. During the weekend, the CEO Challenges folks attended to every detail. A mechanic serviced our bikes after each ride and made sure everything (including pumping up the tires) was ready to go in the morning. He also accompanied us on the rides in a BMC team car. There were a few cycling pros that rode with us to make sure there was someone with each of us on long climbs and that no one was dropped. After rides we got massages. Beyond riding, I ate great meals each evening and got to hang out with CEO/C-level executives and other interesting folks all with a passion for cycling. 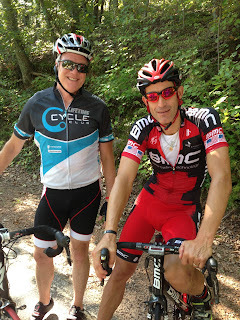 A big part of what made the time special was George Hincapie himself, who rode with us, ate with us, and generally included us in his circle of friends and family. We even had dinner at his house Saturday night and got to meet his wife, kids, and parents. 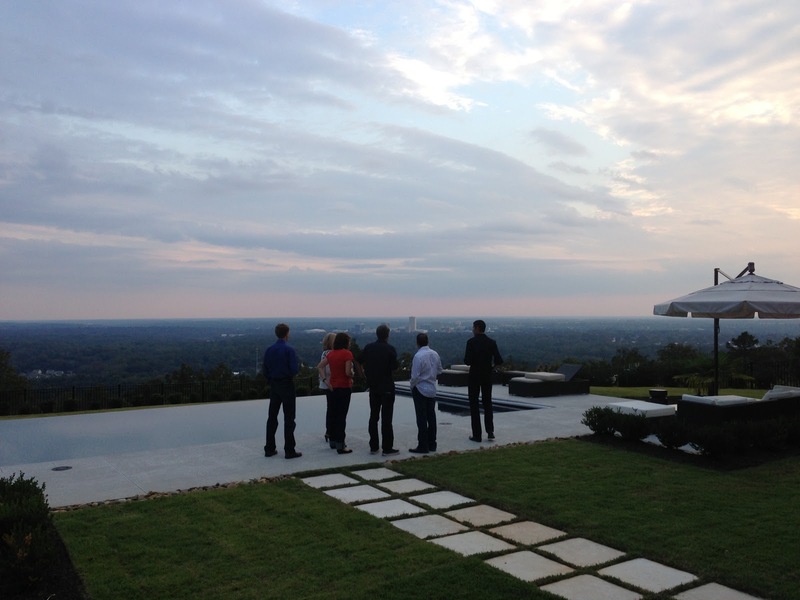 The picture on the right shows the view from his house overlooking Greenville, SC. The picture below is George showing us the bike (in front of a portrait of him) that he rode alone to lead the peleton as they entered the center of Paris this summer in the final stage of his record-setting, 17th Tour de France. That moment had been one that I found very touching when I saw it on TV. It was very cool hearing stories about things that I had watched on TV like Cadel Evans and the tacks-on-the-road episode in this year's Tour de France. Of course, George has been in the news a lot the past few weeks because of the release of his testimony regarding Lance Armstrong. George never discussed any of that, but he was great to be with. Here are a couple stories to illustrate this. On Saturday, there were at least twenty folks riding in a double pace line fairly early in the ride. Somehow, I ended up pulling at the front up a hill. I was not about to let the guy next to me go faster than me, so I pretty much crushed myself to the top of the hill. As I dropped back to the rear of the pace line, I felt a pat on my shoulder and the words “nice pull.” It was George being polite and treating me just like any rider. It made the ride, and possibly the weekend, for me. 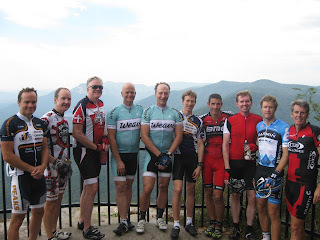 As we rode up Paris Mountain, we each had someone with us to encourage and give advice. The day before, Hunter had told me how to use the power meter to avoid starting out too fast. George rode with me the last couple hundred meters exhorting me to push harder. It was a hard 2-mile climb, but I beat my goal of sixteen minutes by a few seconds. In case you are wondering how my time compared to the others, I came in last place, but I felt my time was respectable. A part of me wanted to come up with excuses such as being the heaviest of the riders by at least 20 pounds or having the least expensive of the bikes there (one was a Specialized Venge McLaren with a list price of $18K). But the real issue was that these guys were in better shape than me. Regardless, it was an amazing weekend. Now, I need to go buy a power meter, sign up for some tough mountain rides next season, and push myself harder with more training! Hello,pleased to read out the post. 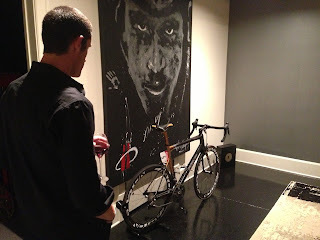 George Hincapie really a great biker. 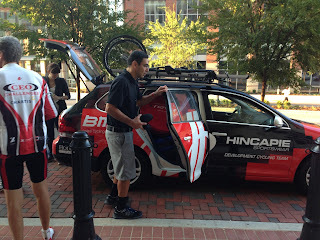 In 2012 he established the Hincapie Sportswear Development Team, initially with support from BMC. He also set a record by completing his 17th Tour of Flanders, surpassing Briek Schotte. Thanks.